“New Art, New Ideas, New Generation,” a J-train advertisement for The Ungovernables, the New Museum’s triennial show boldly promises in large white lettering superimposed on top of an assemblaged pile of junk. The poster’s message seems clear, implying this generation is a generation of phoenixes rising from a discarded heap of debris--resourceful and innovative. Though The Ungovernables is an exhibition of new art--the show includes fifty participants from around the world, many of whom have never exhibited in the U.S. previously--the advertisement only describes the content but not the feeling of the show. Though the work is new to America, the show itself does not feel particularly novel. The title of the exhibition promises rebellion, burning flags, and anarchy, yet this triennal show is more thoughtful and probing than action-based, more soft-spoken and contained than revolutionary. 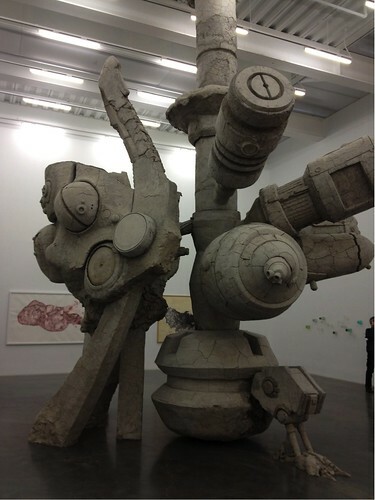 The most attention-grabbing piece in the exhibition, A Person Loved Me, by Adrián Villar Rojas, is a grandiose gray clay Transformer-like sculpture that conjures up bittersweet nostalgia for present technologies. Though the piece taps into the psyche of 2012, reading as a subdued memorial to the technology of our time, the megalith clay artifact is not particularly formidable. 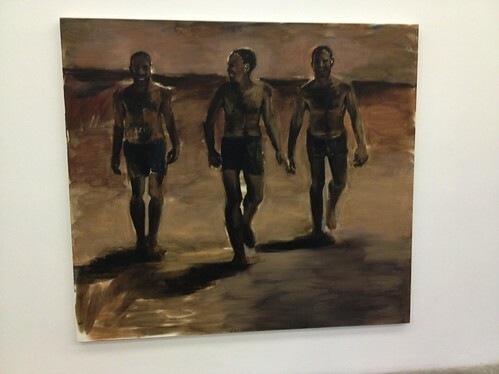 My attention was caught by the painterly portraits of young men by Lynette Yiadom-Boakye, Jonathas de Andrade’s 4000 Disparos, a beautiful black and white film of male faces on the streets of Buenos Aires, and the post-stamp size ink drawings, Accepto que nada es mío, of swarms of minuscule people and natural environments, by Rita Ponce de León. Even though these pieces are reactionary, as the title of the show suggests, the reactions are quiet--probing, but not revolutionary. Though the exhibition title is partly ironic, referencing the “pejorative term used to describe unruly ‘natives’” as the press release states, the exhibition’s title also references an outcry of anarchy absent from the show, especially absent from the works focused on politics. The Propeller Group’s five-channel video instillation, TVC Communism, for example, pokes fun at corporate culture yet does not question the system deeply. The instillation is composed of videos of a staged office meeting where a corporation is strategizing how to rebrand communism as appealing to the public. The irony of the piece stands in the way of the work drawing the vital connections between corporations and government for the piece to actually be political. TVC Communism is more of a theatrical, absurdist comment on office culture than a reflection on politics or capitalism. Like A Person Loved Me, the instillation is submissive, not subversive. The most ungoverned artist in the show is José Antonio Vega Macotela, whose systematic works critique the system itself, namely the prison system and the U.S./Mexican oil industry. Many of his works included in the show were made while spending 500 hours in prison over six years in the name of art. Time Exchange 321, a complicated yet crude chart of fingernail clippings representing amounts of money smuggled through prison, exposes the bureaucracies and hierarchies formulated by inmates within the system. 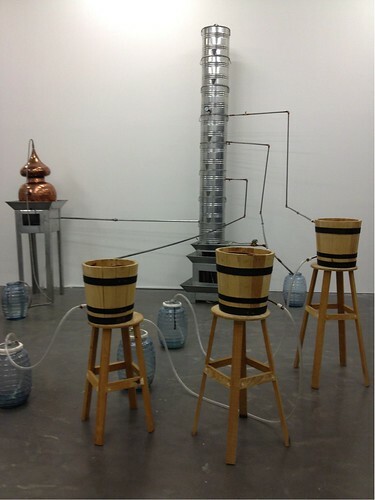 With Habemus Gasoline, Macotela creates a rudimentary oil refinery out of a tequila distiller that challenges corporate technology through do-it-yourself aesthetic action. Macotela’s work is powerful in its resourcefulness, offering a genuine evaluation of the damaged systems of our time grossly overlooked by culture, without the tinge of irony that tends to overshadow potential political messages. The greatest weakness of The Ungovernables, however, is not the soft-spoken art, but that the show does not address the rapidly changing cultural ideology of our times--an ideology that has evolved even since the museum did their last triennial in 2009. Our culture is of a post-internet mentality, a term coined by Marisa Olson, meaning that the internet is a given banality in 2012--we expect the social networks and the infinite access to media and materials that the internet provides, and we put a lesser importance on fixed physical objects and spaces. In the past, people have used art and other cultural objects to form alliances to make change. Yet, with unlimited social networking, we no longer need to congregate around an object to create a network--we no longer need to burn a flag to be ungovernable. With a few strokes of our keypads we can conjure a digital call to arms reaching people all over the world. Because we have the internet space to rely on, the cultural objects we produce does not have to be inherently ungovernable, because we can raise awareness through our own networks. Take for example the uprisings of Arab Spring or Occupy Wall Street, both movements became popular through this generation’s application of the internet. We are ungovernable in the sense that we share information, media, ideas, and images freely, and this sharing does not rely on physical space or a physical object. 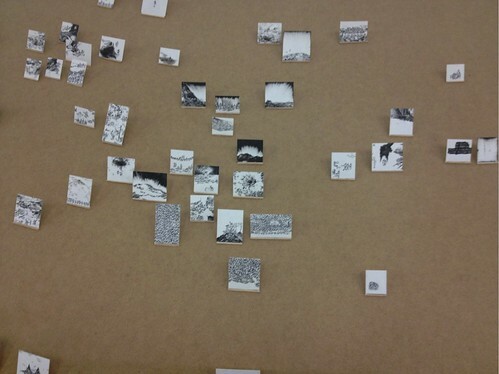 To be ungovernable in 2012 is not take action directly against the system but to form alternative networks. Maybe The Ungovernables did not seem like “New Art, New Ideas, New Generation” because I have encountered these ideas before somewhere out in cyberspace. The art of The Ungovernables is a manifestation of post-internet culture, and this culture is not aggressively action-based or physical like the title of the show suggests, but progressively thoughtful and aware due to our increased online presence of the last decade. In that sense, we are a generation of digital phoenixes arising from a culture of consumption, we are new and resourceful, but not in our ideas themselves, but the way in which we transmit them.